White Wolf : Adorable Pit Bull Sees Her Reflection For The First Time. Adorable Pit Bull Sees Her Reflection For The First Time. Introduced to her own reflection, Lola has the kind of reaction that makes sense for a creature who, until this moment, wasn't even aware of the fact that mirrors existed. The sounds she makes border somewhere on fear and curiosity -- but mostly, they'll just make you laugh out loud. FACTS: In an effort to counter the fighting reputation of pit bull-type dogs, in 1996 the San Francisco Society for the Prevention of Cruelty to Animals renamed pit bull terriers to "St. Francis Terriers", so that people might be more likely to adopt them. Pit bull breeds have become famous for their roles as soldiers, police dogs, search and rescue dogs, actors, television personalities, seeing eye dogs, and celebrity pets. Historically, the Bull Terrier mix Nipper and the American Staffordshire Terrier, Pete the Pup from the Little Rascals are the most well known. Lesser known, but still historically notable pit bulls include Billie Holiday's companion "Mister", Helen Keller's dog "Sir Thomas",Buster Brown's dog "Tige", Horatio Jackson's dog "Bud", President Theodore Roosevelt's Pit Bull terrier "Pete". 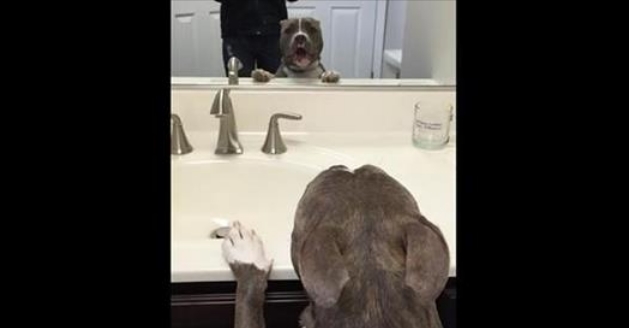 Responses to "Adorable Pit Bull Sees Her Reflection For The First Time. "